A delicate dance between spectator and athlete, a mediation on the properties of the pendulum, and unabashed grin-making installation art piece, Competitive Swinging by Paolo Salvagione, is now up at the Headlands Center for the Arts Gymnasium in Sausalito, CA. “I had no idea what I would do, I just knew I loved the space. The piece reveled itself slowly. All the ingredients were there in my mind, dreams, childhood playground memories, pendulums. The challenge of a space that big is how to activate it, it was built in 1907. I spent the evening there with bottle of wine and watched the space as the sun set. I noticed period hardware on the ceiling that once held climbing ropes, a common military exercise. From that observation the piece came together. The old basketball court ask for 5 people a side and the building has 5 window on each side. The nature of athletics asked for competition, my sense of humor loved the idea of competitive swinging. 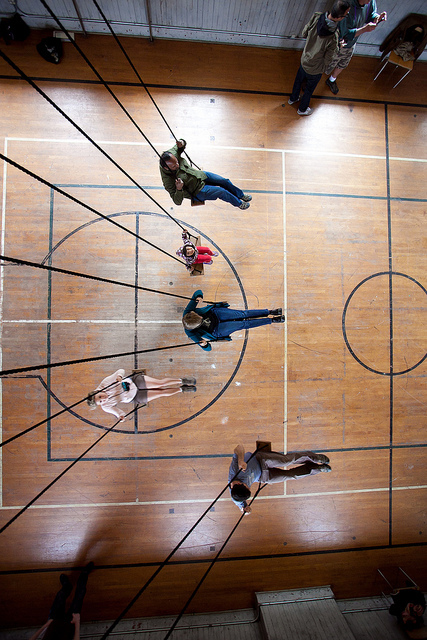 The closing reception for Competitive Swinging will be at the Headlands Center on May 8th, form 12-5pm. In the meantime, call ahead to the Headlands Center to see the piece yourself.